If you are in a Ph.D. program, you are considered a research student by the University. If you are in a research Master degree program (A.M. or M.S., as defined by the University), you are considered a research student. If you are in any other non-research Master degree program (including Ed.D., M.S.E., and other Master of Science degree programs with other letters), you are considered a professional student and will need to apply for funding through the Professional Student Council. Students in the MD/PhD or the VMD/PhD programs should apply for Research Travel Grants during their PhD years and the Professional Travel Grant during their MD or VMD years. Please note that you are only eligible to receive one GAPSA-administered award per academic semester, for a total of 2 such awards per academic year, which begins in the summer. Other restrictions may apply. The GAPSA Research Student Council has some funds available to distribute as individual travel grants to help defray the cost of qualified travel expenses for doctoral students presenting their research at academic conferences and meetings. Recipients must be full-time research students presenting their research at or merely attending conferences, among other eligibility requirements described in the guidelines. Meal expenses are not eligible for reimbursement. Funding is not guaranteed and is dependent on the competitiveness of your application. Funds are limited, and in any given application cycle the total amount requested can more than double the funds available. This grant works on a post-travel reimbursement basis. Please do not be concerned if the application and/or decision date is after your chosen travel dates. The Spring Application Window is Now Closed. Late Submissions Cannot be Accepted. The evaluations have been distributed to the review committee. Please be aware that the committee consists of fellow graduate students like you, who have volunteered their time and labor. The process to evaluate and process over 200 applications will take some time. We hope to send decisions by mid-April. Please be patient. Please note that payment for this grant works on a post-travel reimbursement basis. Valid receipts of payment are needed to fully reimburse travel costs and event fees. Awards are processed through Concur Expense Reports. Note that no applications are reviewed until after the grant window closes. No exceptions can be made. Applications for Summer Travel (between June 1 and August 31) will open in June. All recommendation forms are due by March 17, 2019 at 11:59 pm. In order for an application to be consider complete, you must indicate a faculty member to complete a brief recommendation form. It will be sent to your recommender automatically when your application is submitted. Please note that recommendation forms are sent out only after grant applications are submitted. Be sure to inform your recommender prior to submitting your application. It is YOUR responsibility to ensure that the form is submitted on your behalf. Check with your recommender to make sure they submit the form on time. The Spring Application Window is Now Closed. Late Submissions Cannot be Accepted. If you have received a GAPSA Research Student Travel Grant, instructions for reimbursement are provided with the award letter. Please make sure to read all policies for reimbursement. All reimbursement forms should be submitted to Angela Reason in the Office of Student Affairs (areason@pobox.upenn.edu), NOT GAPSA Research. Are you confused on whether to apply to the Professional Student Travel Grant or the Research Student Travel Grant? 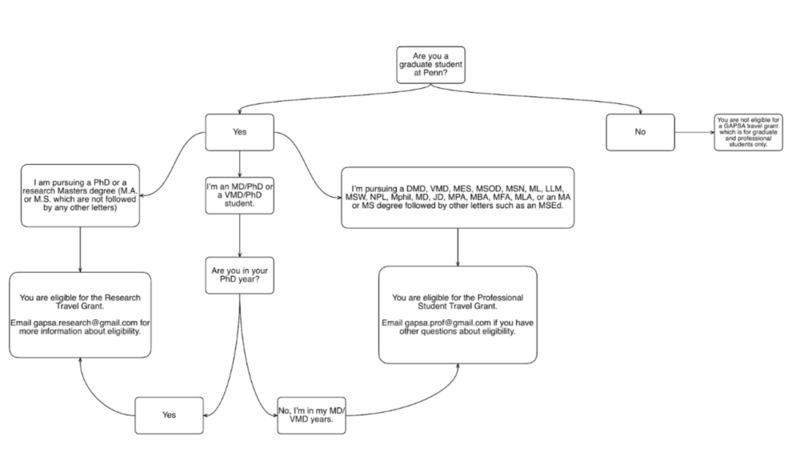 Follow this flow chart to see if you are a Research or Professional Student. Please note that you are only eligible to receive one GAPSA-administered award per academic semester. Other restrictions may apply. The GAPSA Professional Student Council distributes individual travel grants to defray the cost of qualified travel expenses for professional students attending and/or presenting at academic conferences, meetings, case competitions, externships and internships. Students pursuing professional development outside of the university and traveling for residency interviews are also welcome to apply. In order to be eligible for Spring 2019 Professional Travel Grant funding your conference/event must take place between January 1st and May 31st, 2019. All funding is granted retroactively, i.e. you will receive the funds after showing proof of receipt - meaning you will need to incur the expenses before you receive the funding. Do you need funding for something other than a conference? We are all going into different professions and conferences are not what everyone needs. Art exhibitions, externships, internships, mock trials? You are welcome to apply. *Please contact your school's GA rep if you want to add something to the list. *If you received a travel award for residency travel in Fall 2018, you are not eligible to apply for a travel grant for residency interviews in Spring 2019. The applicant must be a full-time or part-time Penn professional student at the time of the conference. If the applicant is already receiving two or more forms of funding, they are ineligible for a travel grant. The Spring Grant application will open on February 15, 2019 and close on March 15, 2019. Recommendation Applications will close on March 17, 2019 (i.e. two days after the closing of the grant applications. Please note: recommendation forms are sent out only after grant applications are submitted). All awards are processed through Concur Expense Reports, via retroactive reimbursement. Valid receipts of payment are needed to fully reimburse travel costs and event fees. Disbursements and awards will be finalized as soon as possible, and awards should be accepted within 30 days of receiving this reward or 30 days of the conference date. All recommendation forms are due by March 17th, 2018 at 11:59 pm. *** Sending a "Recommender Application" is not necessary, but it will help your application. You would indicate a faculty member to speak on your behalf and they must complete the form that is sent to them. You must inform your recommender prior to submitting your application, that they will receive a "Recommender Application" to be completed. Please verify with the recommender that they have received the form via email. If the recommender for some reason has issues with the form, please have them contact gapsa.prof@gmail.com. Note that we have experienced complications with Penn’s network blocking submissions from the jotform website. We are working to resolve this with Penn’s IT. If you are unable to access a non-Penn wifi network, please check back here for updates or alternatives as we work with Penn Computing. We apologize for the delay and inconvenience. President Amy Gutmann has generously provided additional funding to GAPSA to augment GAPSA’s funding for graduate and professional student travel. The award will be given to students presenting at either an international conference, or a conference within the United States that would normally be out of their budget even with an individual travel grant through the Research or Professional Student Councils. The maximum award is 70% of the total budget or $2000, whichever is less. The applicant must be presenting original work at the conference. The minimum budget for the trip (airfare, transportation, conference feeds, lodging, and other eligible expenses) is $1000. All expenditures are subject to audit. A faculty recommendation is required, and should be submitted by the recommender, according the the instructions laid out in the guidelines (see below). The selectivity rate, according to historical data, is approximately 10%. You may only receive this award once per year. Late applications will not be accepted. A confirmation email will be sent after your application has been received. Decisions will be announced three weeks after the submission window closes. All recommendation forms are due by April 2, 2019 at 11:59 pm. In order for an application to be considered complete, you must indicate a faculty member to complete a brief recommendation form. It will be sent to your recommender automatically when your application is submitted. Please note that recommendation forms are sent out only after grant applications are submitted. Be sure to inform your recommender prior to submitting your application. The GAPSA-Provost Fellowship for Interdisciplinary Innovation is a program jointly funded by GAPSA and the Office of the Provost for the expressed purpose of fostering an interdisciplinary graduate and professional environment at the University of Pennsylvania. This highly competitive fellowship strives to promote original, student-derived initiatives that integrate knowledge across diverse academic disciplines. The fellowship is also meant to help the project-leader(s) develop, pursue and complete their proposed interdisciplinary initiatives. There are two types of Fellowships: Academic Year and Summer Fellows. Academic Year Fellows (Applications due October 21; chosen by November 5th) are expected to complete their projects between mid-November and early-April of the 2018/19 Academic Year, to present late-April/early May. Summer Fellows (Applications due April 1; chosen by late April) are expected to complete their projects over the course of the summer, to present in early September. Applications for Summer Fellowships are now open. The applicant must be a full-time or part-time Penn graduate (professional or research) student continuing their studies in the semester following the awarding of the fellowship. Applications are due on April 1, 2019. Letters of Recommendation are due by April 5, 2018. Detailed fellowship application information. Click Here. When “Other” Becomes “Self”: Can Virtual Reality Reduce Racial Biases Towards Students? The GAPSA Committee for Equity & Access (E&A) is piloting a new funding source. GAPSA E&A has limited funds available to distribute to current Penn Graduate students who are members of marginalized and/or underrepresented population within the University. This funding (not to exceed $500) is intended to help defray the cost of “life” and/or extenuating circumstances (i.e., circumstances beyond one’s control) that cause a barrier or excessively complicate one’s ability to garner the most from their time as a University of Penn-Graduate student. • Advance or direct payment of transportation-tickets to educational or professional events (e.g., conferences, trainings, professional developments etc. ), for students that otherwise would not be able to register for the event without the GAPSA: E&A direct funding; this does not include car/cab fare for local with-in city/town travel etc. • Wellness / Excursion Funding Grants for personal development and/or cultural enrichment excursions for students that otherwise would not be able to obtain these experiences. Group applications to the same destination with the same objectives are strongly encouraged. Those requesting Direct/Advance payment will receive notification on a rolling basis during the time that the application is open. All GAPSA Awards are subject to audit, the turning in of receipts and/or other verification of funding usage. Regardless of any and all factors, GAPSA and GAPSA Equity & Access reserve the right to deny applications; we will try to avoid doing this, however funding is limited and applications are not evaluated on a ‘first-come, first-serve’ basis. Please compile as many parts to your application as possible into ONE (1) e-mail with attachments; do not paste or write the application materials into the body of the e-mail. Letters of recommendation can come separately. A statement 1 to 2 (max) pgs introducing yourself, explaining your life/extenuating circumstances and why you will not be able to accomplish your goal or task without this funding. Please be clear or specific yet succinct. You must identify which marginalized and/or unrepresented University of Penn Graduate Student population you are a member of, provide as much detail as you feel is appropriate. A letter of support from a non-student member of the Penn community OR a person outside of the Penn community who can best speak your strengths as an individual, as a student and as a member of larger society. You must contact this person and explain to them how to submit the letter to us. We WILL NOT REQUEST a letter on your behalf. If you are concerned, you can contact us within 5-business days to see if your letter has been received by us. This fund IS NOT for Student Group or Affinity Group events, outside of the Excursion option which can, but does not have to be, done in collaboration with an IDEAL Student Group. GAPSA Equity & Access reserves the right to ask for more details and/or meet with you as or if needed. If you identify with a marginalized population not listed here, simply write it in in your application, (no need to e-mail and ask for permission first) and explain what it means to you and why you need this funding. If you have received a GAPSA Equity & Access Grant, instructions for your payment are provided with the award letter. Please make sure to read all policies. All required forms should be submitted to Angela Reason in the Office of Student Affairs (areason@pobox.upenn.edu), NOT any branch or committee of GAPSA.